The quick answer is that you can use the b hotkey to interactively adjust the source brush size on the fly as you are working. To do this, you hold down the b key and then mouse down in the canvas. You can then draw an interactive dashed line to define the new source brush size you want. When you release the mouse the source brush will be adjusted to the size you specified. If you are using a Wacom pen, you can adjust the current eraser preset’s brush size by using the b hotkey as described above with the eraser tip of the pen. Using the normal drawing tip end of the pen with the b hotkey will adjust the current active paint synthesizer preset the same as if you were using a mouse. The actual brush size you end up painting with is a function of several different parameters in the paint synthesizer. The source brush size is a maximum brush size that can then be modulated manually or interactively depending on the parameters specified in the Brush Modulation control panel. So the final sizing of the brush when you draw is a function of 2 different control panels, Brush Source and Brush Modulation, as well as potentially how you use an interactive modulator like pen pressure or tilt when you are drawing. Let’s run through an example of how this all works. We will start with the Default : Utility : Bristle Paint-Flat preset. If you import this preset and look at the size specified in the Brush Source control panel in the paint synthesizer, you will see that the brush size is set to be 32 by 32 pixels. If you now hold down the b hotkey you can interactively resize the source brush in the main draw canvas as shown below. The length of the dashed line you are drawing out with the mouse will be the new source brush size. This is the maximum brush size, so the actual brush size you end up drawing with will be based off of this maximum size and the parameters associated with size modulation in the Brush Modulation control panel. As shown below, the Horizontal and Vertical Size parameters in the Brush Source control panel have been resized to match the new size i interactively specified when using the b hotkey. I could have just gone to the Brush Source control panel and manually edited the Horz and Vert Size parameters to resize the brush. The b hotkey is just an editing shortcut that allows you to do this on the fly by interactively drawing as opposed to editing sliders or numeric edit fields. The screen snap below shows what happened when i used the mouse to draw with the resized preset. The brush appeared to get larger, but it only seems to be half the size i interactively specified for the source brush. Why is this the case? 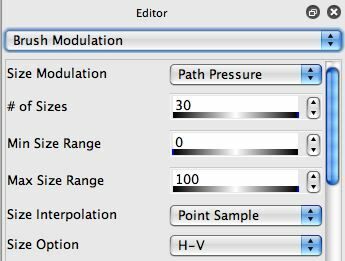 The answer can be found when we look at the parameter settings in the Brush Modulation control panel shown below. The brush size is being modulated by the path pressure from 0 to 100%. But i was drawing with the mouse, and since the mouse doesn’t have interactive pressure modulation it is defaulting to 50% modulation. If i use a pressure sensitive pen and tablet to draw as shown in the example below note that the maximum brush size when i press the hardest is now matching the maximum size i specified for the source brush above. Some paint presets have what can be thought of as a virtual brush. Virtual brush means it may appear to you that you have a large brush size but the actual source brush might be tiny and something like Path Randomization is shifting the positioning of the small source brush on the fly as you draw to simulate the appearance of a much larger ‘virtual’ brush. The example below shows a 12 pixel source brush on the left and a much larger virtual brush on the right created by path randomization of the small source brush. If this is the case, then when you want the virtual brush to get larger you might actually want the path randomization that defines the size of the virtual brush to get bigger as opposed to the source brush itself getting bigger. There are some ReRender parameters located in the Vector Output control panel in the paint synthesizer that can specify which of these 2 resizing options occurs when a paint preset is ReRendered. There are 2 different ways to manually resize a brush. Holding down the optn and b keys will just resize the Brush Source control panel dimensions, nothing else. Resizing by using just the b hotkey actually runs the rerender code for the paint synthesizer to resize the brush. This type of brush resizing can be more intelligent, and it’s behavior can be controlled to a certain extent by the programmer of a particular paint preset. The rerender algorithm will look at the rerender settings specified in the Vector Output control panel when it resizes a brush. So if you have specified a Microstructure rerender Scaling option when you created a paint preset that is using a virtual brush then whatever is creating the repositioning of the source brush will be scaled as opposed to the size of the source brush itself. Rerender resizing also rescales any internal procedural textures associated with a paint preset. So it could potentially be adjusting many more parameters than just the source brush size. And in the case of virtual brushes we discussed that are created with source brush positioning microstructure, the source brush size may not be adjusted at all when the preset is rerender resized. Option b resizing ran the rerender code in versions of Studio Artist prior to version 4.03. In version 4.03 we switched things so that the normal b brush resizing actually ran the rerender code, and option b only resized the source brush. So this is the reverse of the way things used to work. While this is a possible source of confusion for some older users, we felt that when people want to resize the brush they really want to run the rerender code in most situations, so making the b hotkey resizing do this will hopefully make things clearer for new users and people who don’t care to understand what is going on under the hood and just have the brush resize in an intelligent way.